Procellix claims that their anti-cellulite cream far exceeds the expectations of customers by using a unique ingredient list and patented delivery system that causes cellulite and fat to simply melt away. These ingredients do this by improving circulation as well as assisting the individual in losing weight which contributes to the appearance of cellulite. 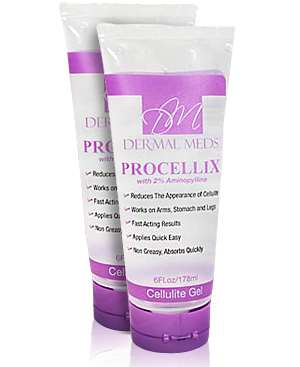 Procellix claims that their anti-cellulite cream far exceeds the expectations of customers by using a unique ingredient list and patented delivery system that causes cellulite and fat to simply melt away. Looking at the ingredient list, this may in fact be possible. Procellix Aminophylline Cellulite Cream contains many ingredients that are popular in other anti-cellulite creams, such as caffeine, aloe vera gel and natural extracts, in addition to other ingredients. Carboner works in a similar manner to caffeine, so customers are essentially getting a double dose of the benefits of caffeine with this product. Tetrasodium EDTA assists the skin with absorbing the cream at a faster rate, ensuring that it absorbs all of the ingredients. We liked that there were a significant amount of positive individual’s reviews that appeared to be from users that genuinely used the product, as well as some other things. No side effects or reported allergic reactions is always good news, and the fact that this product does not leave a greasy residue on the skin is also wonderful. 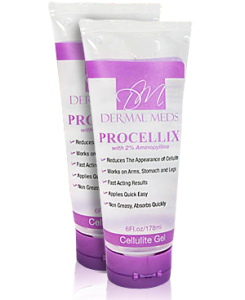 The pleasing fragrance of Procellix Aminophylline Cellulite Cream is another bonus! There were also a few things that we didn’t care for when it came to this product. The first thing we didn’t like was the price. Approximately seventy dollars for one bottle is a bit steep. While the company does offer discounts for larger orders, such as about one hundred dollars for two bottles, this price is still above average when compared to prices of similar products with similar ingredients. Another thing we didn’t particularly care for was that the company claims it can take ninety days to see results, or they can be seen in as little as three weeks. While this does vary depending on the skin type, no anti-cellulite cream should take ninety days to deliver some form of transformation. This product may be worth the price, but we wouldn’t keep using it for ninety days without seeing positive change!